We all know where this is going. The trees up before turkeys on sale, the red and green garland over taking the beautiful orange glow of the harvest. 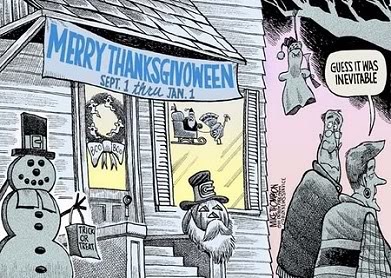 Christmas before Halloween with skipping Thanksgiving. I will fully admit that because we are going out of town next weekend to Arizona, I put up the Christmas decorations this weekend. And while I fully agree each celebration deserves its time, just some things to keep in mind before you start criticizing which holiday people choose to focus on before the others. To many people-holidays hold meaning. Though they are meant to remember some historical event or particular belief, to most they are connections to their family, friends and loved ones. For some, Halloween might be a time when they remember those who have past-where Christmas may represent the same meaning. Therefore people may choose to move on/move past holidays or dwell on them for longer than normal. I know for me–Christmas is not only significant because of my beliefs in Christ, but also my family always came together at Christmas. We were taught that while Christ is Lord of all, Santa gives gifts to children and I always prayed he’d give more to those in need. So I tend to desire to start Christmas early because of the things I am thankful for throughout the year. Thanksgiving always reminds me of my Indiana family because its one of the few holidays I spent with them. But it also reminds me of my struggling eating habits and many times I glance over it because gratitude should be practiced year round. If you think about it–most holidays were created to remember something. Halloween has historical roots in early Celtic communities but was created as a holiday by the Catholic Church for “All Saints Eve.” Christmas is not documented until about the 300s CE by a nun. Thanksgiving is associated with the fall harvest where we are called to be thankful for what we have and what has come this year. While every holiday has great qualities–there are still created entities. So to uphold then equivalent to the morals they are meant to each is sometimes stretching it. Not everyone celebrates every holiday. Even holidays were think are standard in America (like Thanksgiving.) They may have different beliefs, difficult memories, or just plain don’t like them. They may simply enjoy one holiday over the other or are going out of town to celebrate in another location. So may I suggest embodying the holiday you feel strongly about and providing encouragement through your actions for the holiday you wish others shared with you. Positive reinforcement/encouragement works better than the negative any day. So I hope this post provides some words of wisdom. and that whatever you celebrate, have a happy holiday and merry hallothankstmas! This entry was posted in Theological ThinkTank and tagged holidays, thanksgiving blues.